…because that’s what I have to be. What am I doing? 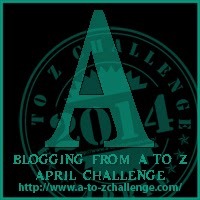 Sure, the A-Z blogging challenge sounds like fun. Yes, there might be more than 2,000 people participating this year, and I’m excited to see what they have to say on whatever topics they come up with. And yeah, maybe I’ll even manage to make a new blog friend or two out of it. All of that aside, this is crazy. It’s April. I’m participating in Camp NaNoWriMo this month, though as of today I still don’t know what to work on. I have a low word count goal, but that’s because I’m going to be spending most of the month editing, God willing. Other plans for April include working on front- and back-matter for a book release, working through feedback from beta readers on a side-project, setting up a Facebook author page, doing up a newsletter for release late in the month, and researching reviewers who might be willing to give my book a look-see. Oh, and I think round 2 of ROW80 is starting. So why throw a blog challenge in there that requires me to post six days a week all month? I’ll tell you why. Because I don’t have to post more than 100 words on any given day. Because if I let myself just relax and don’t stress over missed days, this could actually be fun. Because it gives me something to post about besides FLAAAARRRRGH. Because I can maybe, possibly, kinda schedule some of these ahead of time. Or say… all of them. Will I make it through the month? I don’t know. Other things are more important. But I’m going to try to post, and to visit different blogs each day until the end of the month (plus my friends and family who are participating, of course). This will require B for Balance and O for Organization. And T for Time-Management. Possibly D for Drugs. ** You might see less of me on Facebook and Twitter. If I miss something important on your blog, friend, please punch me in the back of the head to get my attention. But not too hard. I still need C for Consciousness. Thanks. **Not really. Don’t do drugs. Stay in school, kids. This entry was posted on Tuesday, April 1st, 2014 at 7:57 am	and tagged with blog, blogging, challenge, priorities, writing and posted in A-Z blogging challenge, blogs. You can follow any responses to this entry through the RSS 2.0 feed. Yup! It’s gonna be A for Awesome. And E for Exhausting. But W for worth it. I hope. I think you are definitely A for Absolutely Bonkers. I considered doing this challenge, but then I chickened out for all the reasons you list. Well, similar ones. I also had a craving to do Camp NaNo, but am insisting on editing instead, despite a faint gnawing feeling in the pit of my stomach encouraging me to write something new. Wow. Good luck and hopefully you avoid the padded room. Always a bit of masochism in an author. THAT’S when I’d need the padded room, methinks. Good luck with April, it sounds like it will be lots of fun, despite all the madness! You know what they say – if you want something done, give it to a busy person…..
I’m doing A to Z too and kind of signed up for Camp Nano. Not sure if I’ll stick with it yet, but I love how it keeps me motivated to meet that daily word count goal. Good luck! Loved your A to Z post. I can’t wait to see how you manage 🙂 Cheers and best of luck!!! I’m also participating in Camp Nano, so yay for us! You sure have lots of things to do, but I’m sure you can do everything. Girl power! Ahahah! I’ve signed up and failed before, but it is a REALLY fun challenge, and I’m hoping this time I succeed and feel like a champ! 😀 Looking forward to the rest of your posts, dropping by from sujataravi6.wordpress.com for the A-Z challenge. Looks like you had the same idea I did! Editing is going well so far, but I’ve only just hit the halfway point and I haven’t even touched the 20k of writing I’ve committed to for Camp NaNo. As long as you’re making progress, i’d call that a win!